THE IRRAWADDY is the chief river of MYANMAR, or Burma. It is formed from the confluence of the Mali and N’mai rivers far in the northern highlands on the borders with CHINA, and flows 1,350 mi (2,177 km) before entering the Andaman Sea (a section of the BAY OF BENGAL). The river’s extensive DELTA begins about 140 mi (225 km) before it reaches the sea, and splits into nine main channels. It is estimated that the waters of the delta lay down 260 million tons (236 millionmetric tons) of silt per year. The capital city of Yangon (Rangoon) is located on one of these delta channels, though not the main river course, located about 70 km (43 mi) to the west. About a dozen large sea inlets form the mouths of the Irrawaddy, spanning roughly 300 km (180 mi) from west to east. The delta is protected by levees for hundreds of kilometers and is one of the chief rice-exporting areas of Southeast Asia, formerly awarding the area the nickname, the “rice bowl of Southeast Asia.” Steamers can transport goods upstream as far as Bhamo (about 1,000 mi or 1,600 km), nearly to the borders with CHINA’s Yunnan Province. The country’s major oil pipeline follows the course of the river from oilfields near Chauk down to export facilities at Yangon. Highlands in the east, and the Arakan Yoma and Chin Hills in the west. The country’s other main river, the Salween, also travels through the same sort of north-south valley, though much narrower (and actually for a much greater distance, originating far inside the Chinese border). A third river, the Sittang, while much shorter, is more comparable to the Irrawaddy in its importance as a chief rice-growing area. Most of the Burmese population lives along these valleys, both in the north, around the city of Mandalay, and in the southern delta. The river, officially spelled Ayeyarwady, can be divided into two main sections, above and below Mandalay. Above this point it is swift and narrow, with several rocky defiles. But just below Mandalay the Irrawaddy joins with its chief confluent, the Chindwin River, and it becomes broad and slow-moving, ranging from 1 to 4 mi (1.5 to 6.5 km) wide. During seasonal floods, however, the currents can be much quicker and hazardous to river traffic. Forests along the river have virtually been eliminated and continue to be cut down at a rate of approximately 2 million acres (800,000 hectares) a year. The Mon River is also a major tributary, with one of the earliest (and largest) dams in the region, built in 1906 and recently renovated, providing extensive irrigation to the upper reaches of the country’s western regions. 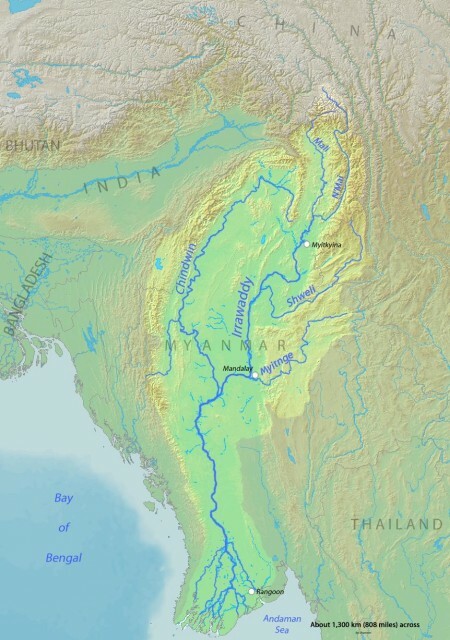 As the commercial center of the British colony of Burma, the Irrawaddy River valley attracted numerous commercial wet-rice planters from the 1850s, funded by money lenders from Calcutta (KOLKATA), INDIA, a source of later friction between independent India and Burma. From 1855 to 1930, the area cultivated for rice increased from 988,000 acres (400,000 hectares) to 9.8 million acres (4 million hectares), and the population increased from 1.5 million to 8 million. Production dwindled during decades of socialist rule but is starting to pick up again under programs of economic liberalization and remains the regime’s most important source of foreign revenue. Today, the river is seen as a unifier of the nation’s diverse ethnic groups who populate its banks—including the Kachin, Shan, and Chin minorities—whose independent spirits frequently threaten to pull the state apart.